Everyone relates Volkswagen to the iconic original Beetle. Almost everyone has either owned one or knows someone who has. From that humble beginning, Volkswagen now produces a large range of vehicles from the “hot hatch” Golf, CUV Tiguan, SUV Touareg, GTI, upscale CC, mid-size Passat, New Beetle, to the Jetta. It is easy to see how Volkswagen has become the second biggest car manufacture in the world. European Auto Tech’s master technicians have been performing routine maintenance, diagnostics and repair of all models of Volkswagen vehicles for years. Our knowledgeable and courteous staff has the experience, skills and equipment to affordably diagnose and repair all Volkswagen issues, and provide the regular preventative maintenance your Volkswagen needs to keep it running smoothly. Once we have diagnosed a problem with your Volkswagen, our goal is to share as much information as possible with you, along with our recommended solution in a way that is easy to understand. In many cases, we will discuss different options for repairs and the risks and benefits associated with each. No work is conducted on your Volkswagen without your express permission to do so. 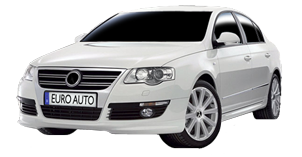 Our objective is to always provide you the highest quality repair at competitive pricing, all the while treating your Volkswagen as if it were our own. The following are some of the most common services and repairs we have performed on our Tucson client’s Volkswagens. Lower control arm bushings on Jettas and Golfs tend split open, allowing the rear of the control arm to detach from the bushing creating the clunk. Also upper front strut mounts tend to “flatten”, allowing more play between the upper part of the front strut and the body. A common problem on both Volkswagen’s and Audi’s are the braided vacuum lines deteriorating. When this happens, it can cause a multitude of drive-ability issues such as rough running, fuel poor economy and performance, check engine light on and codes set in the ECU. We replace these lines with a quality silicone vacuum line that lasts. Although there are other components that can cause your engine to overheat one of the more common problems with Audi’s and Volkswagen’s are failed cooling fans. There are three type of cooling fans used: electric, viscous, and belt driven. Although the electric design is the most common to fail, the viscous fan can fail due to leakage, and the belt propelled type by the belt breaking due to age and condition and if the electric cooling fan in this design fails the belt driven fan will also not work.. Although most models have two primary fans, even a single failed fan will effect vehicle performance. Inoperative cooling fans encourage other cooling system components to fail prematurely due to overheating. The a/c compressor also relies on these fans to cool it, a failed fan can sometimes lead to an inoperative a/c system. Volkswagen window regulators fail at a high rate. They use plastic guide and roller with thin cables to raise and lower windows, which is not a good recipe for longevity. European Auto Tech can replace these problem-prone parts with higher quality, long-lasting replacements. Though it may seem that way, your sunroof is not possessed! The sunroof switch itself is acting up and the sunroof control unit misinterprets the false signal and opens or closes the sunroof. This can even happen with the key off and the car locked. Not a good thing if it is raining! One of the more common problem with engine misfiring is coil on plug type ignition coil. If the Check engine light is flashing, it is not advisable to drive the car. Instead, arrange a tow to European Auto Tech to perform a proper diagnosis, to prevent further damage can result from driving your car in this condition. A common Volkswagen issue is leaking camshaft tensioner/adjuster gasket. This job can be misdiagnosed as a leaking valve cover but in reality it is the gasket causing the leak. As with all repairs, proper diagnosis and explanation of your repair options is essential. Service codes indicating the ECU for Coolant Temp Sensor are a result of the coolant temperature sensor itself failing. The part number for the sensor has been superseded numerous times, and European Auto Tech can work with you to repair this issue in a way that will last over time. Intake valves, EGR valves and intake tracts tend to become “carboned-up” on the TDI. The appropriate fix is to remove these components and physically clean out the carbon. Sometimes the intake manifolds need to be “hot tanked” to remove the excessive clogging. A maintenance item that is often over looked. The manufacture recommends 100,000 mile intervals, at European Auto Tech we recommend replacement intervals of 60,000 miles. We have seen too many broken belts causing major engine damage when the engine valves collided with the pistons. Regular preventative maintenance in this key area can greatly prolong the life of your VW and prevent catastrophic repair bills. Volkswagen utilizes constant velocity joints on the front axles to drive the wheels. These CV joints have boots to keep dirt out and grease in. these boots live in a harsh environment and are prone to tearing and cracking. Once this happens the grease slings out of the CV joint and dirt gets inside. This clicking noise is the CV joint itself because it is full of dirt and dry of grease. If the boot is not replaced and the joint cleaned and greased it can lead to CV joint failure. Another indicator is dirty grease on the inside of the front wheels. We can diagnose and repair this issue in your VW. A common failure in Audi and VW Passat automobiles is the upper control arm bushings tearing and splitting. This is an often overlooked problem by most shops. These bushings do affect the alignment also and will cause accelerated tire wear. The good news is we can simply replace the bushings, instead of the entire arm, as long as the ball joint on the end is in condition, saving you time and money down the road. When it comes to Volkswagen service, we have you covered. Our knowledgeable staff and fully equipped shop will provide you with the most comfortable Volkswagen experience you can have. We will take care of your Volkswagen as if it was our own. Our service includes anything from routine maintenance to complete and accurate mechanical and diagnostic repairs. Below is a list of the services we offer. If you don’t see what you need, simply contact us and we will be happy to help. We offer a comprehensive buyer’s inspection of pre-owned Volkswagen vehicles. We perform a thorough check of major systems, body and chassis, suspension, brakes and drive-train. We then compile a complete report for the buyer giving the buyer a sense of what expenses may be incurred in the near future, how well the car was maintained and the overall condition of the vehicle, allowing you to make the most informed Volkswagen purchase decision. We can perform your required or necessary maintenance services while your Volkswagen is still under factory warranty. We use factory approved parts and lubricants. We will stamp your maintenance book. You are not required to take your Volkswagen back to an authorized dealer for services or maintenance services that you are required to pay for. Contact us for details. European Auto Tech will work with your extended service agreement or warranty. We will review your coverage, obtain the necessary approvals and process the required documentation. Use the form below, or contact us by phone, to schedule an appointment to service, repair or inspect your Volkswagen vehicle at our 1st Avenue shop in Tucson, Arizona. Let our master technicians and courteous staff make you our newest in a long line of satisfied clients. Welcome to the European Auto Tech family. Please note: This is a request form. We will contact you to schedule your actual appointment. What service needs to be done? What dates/times are best for you? Great service and very nice people to deal with! I’m from Sierra Vista and chose this place based off what the previous customers had left to say and I’m glad I went to EAT. I will continue to bring my vehicle to this place for any services. Thanks a lot! European Auto Tech is not like the others – they actually listen to their customers! While troubleshooting a weird, complex problem, they involved me in the process of finding a solution. My hunch told me that the solution was something different than simply replacing an electronic module. Mark, my technician, was persistent and found the root cause of the problem an offered a safe, innovative and inexpensive solution that seems to be working perfectly! Well done!